The Coastal Fluvial Flood (CFFlood) model for assessing coastal and fluvial flood impacts under current and future climate and socio-economic conditions is presented and applied at the European scale. Flood frequency is estimated as a function of river flows, extreme sea levels and estimated defence standards to determine the flood extent and depth. Flood consequences are estimated by combining the latter with information on urban areas, population density and Gross Domestic Product (GDP). Climate and socio-economic scenarios and possible adaptation choices are included to analyse future conditions. In 2010, almost 6 % of the European population is estimated to live in the 100 year flood area. The corresponding economic loss is €236 billion, assuming no defences. Estimated flood protection reduces economic damage substantially by 67 to 99 % and the number of people flooded is reduced by 37 to 99 % for the 100 year event. Impact simulations show that future climate and socio-economic conditions may increase flood impacts, especially in coastal areas due to sea-level rise. In contrast, impacts caused by fluvial flooding sometimes decrease, especially in southern and western regions of Europe due to decreases in precipitation and consequent run-off. 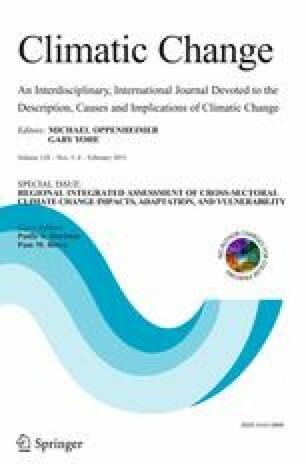 Under high-end scenarios, flood impacts increase substantially unless there are corresponding adaptation efforts. The online version of this article (doi: 10.1007/s10584-014-1298-6) contains supplementary material, which is available to authorized users. The research leading to these results has received funding from the European Commission Seventh Framework Programme under Grant Agreement No. 244031 (The CLIMSAVE Project; Climate change integrated assessment methodology for cross-sectoral adaptation and vulnerability in Europe; www.climsave.eu). CLIMSAVE is an endorsed project of the Global Land Project of the IGBP. The authors would like to thank two anonymous reviewers for their comments on an earlier version of the manuscript.